Some of my colleagues are unhappy that I am, as they put it, airing the dirty laundry by criticizing terrible editorial cartoons. I don’t get it. It’s not like these things are state secrets. They’re published in newspapers. They appear on the Internet. Pointing out that they are terrible doesn’t require speaking out of turn; everybody already knows that they are terrible because only have to do is look at them to see that they are terrible. All I do, as I see it, is describe and articulate why I think they are terrible. It’s not like I have any special power to censor bad editorial cartoons – although that would be great – or that anyone is going to get fired because of something I write. It’s just my opinion. And I suspect that it is an opinion that is more widely shared than the lazy hacks who create this crap would like to think. First and foremost, this is not a political cartoon. It does not express a political point of view. 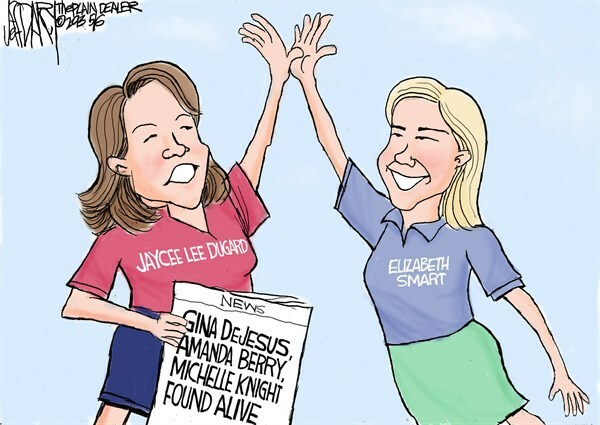 I happen to know that the cartoonist is a Republican, but you can’t possibly tell that from the cartoon. What is the take away message? 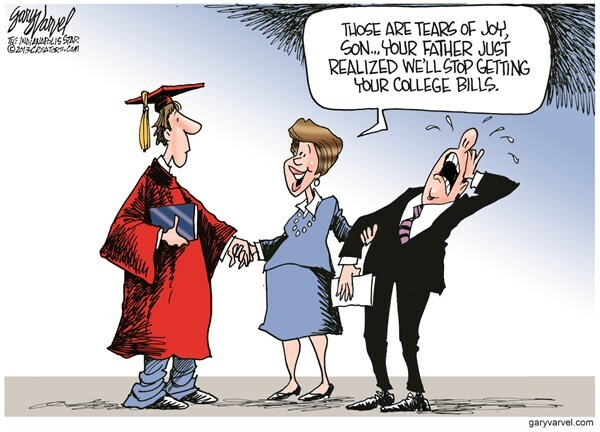 College is expensive. Yeah, like everyone didn’t already know that. I’m never going to get the four seconds back that I spent reading that. This is one of those cartoons that you practically need a decoder ring to figure out. Unless you are the biggest political wonk in the world, you’ve probably forgotten about South Carolina Gov. 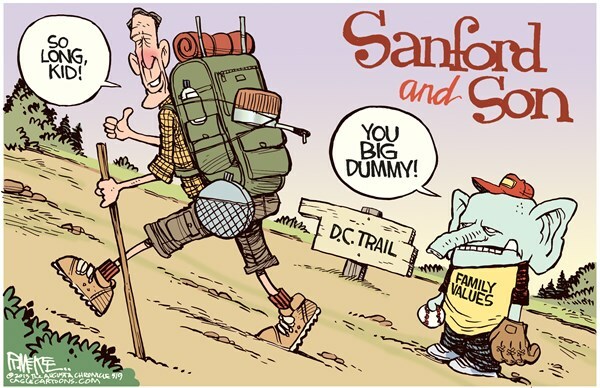 Mark Sanford and his lame excuse for going AWOL while he was sneaking off to Argentina on taxpayer money in order to visit his girlfriend: that he was hiking on the Appalachian Trail. 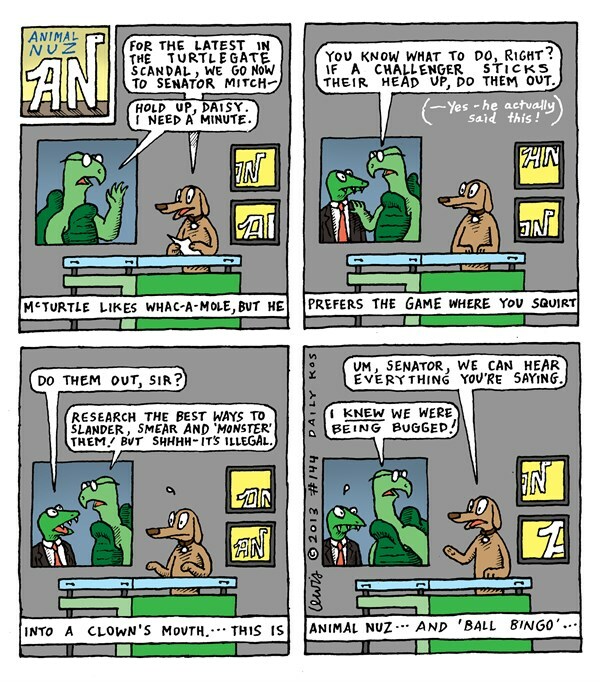 But what really gets me, and it showcases just how old-fashioned mainstream editorial cartooning is, is the reference to the 1970s TV show “Sanford and Son.” I’m nearly 50 years old, and I was 14 years old when the show was canceled in 1977. In other words, I’m about as young as you can be and still remember it. When you do a cartoon that can only be referenced in terms of pop culture by people who are older than 50, you are giving up on the present – never mind the future. 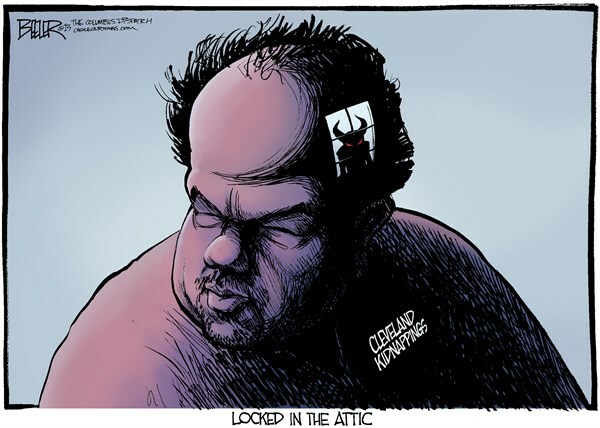 In recent years, in a formatted trope that I think we began with Mike Ramirez, many cartoonists have started doing this below-the-frame caption thing, like the “locked in the attic” here. The effect is incredibly pretentious. It says I am smart and you are not. Ta-daa! Furthermore, the inherent weakness of the metaphor format shows through here. This is a drawing of the suspect in the Cleveland kidnappings. 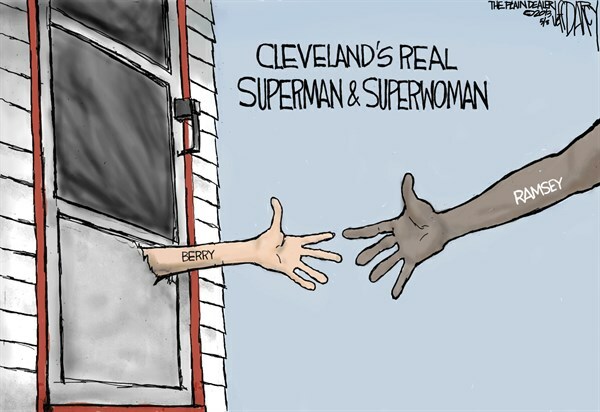 So why is he labeled Cleveland kidnappings? He isn’t the kidnappings. He is the kidnapper. Ultimately, the biggest problem with this cartoon is the simpleminded and vacuous concept behind it: that this is all explained by evil. You know, like he’s possessed by a demon. Which, frankly, if true should allow him to walk free. Or at least walk free after he has his demons exorcized by a crazy priest. 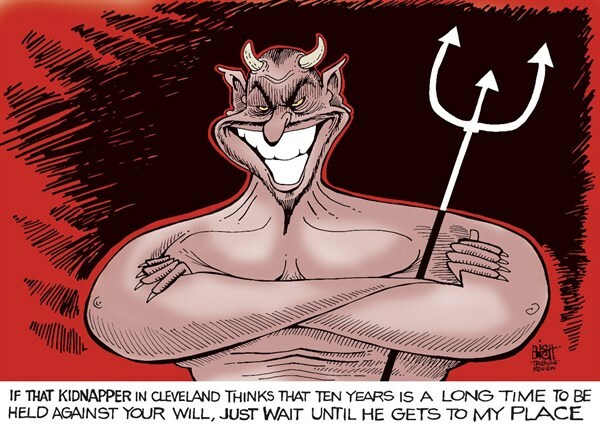 Somehow, I doubt that the right-wing cartoonist who drew this cartoon really believes that this guy is possessed by a demon or the devil or Satan or whatever. All you are really left with is: some people are bad. Which, I already knew. And it’s not a political statement. So it should not be marketed as a political cartoon. When I become cartoon dictator of the world, I am going to ban all editorial cartoons that point to anyone and say: that person is a hero. Editorial cartooning is an inherently negative medium. It is here to criticize, not praise. When you praise anything, you look cheesy and stupid. In this format. The only exception would be if you praise someone who is widely vilified by the mainstream media and American culture. This runs in Daily Kos. I do not. Totally retarded. Telling the public or for that matter the victims of a crime that they can take comfort in a fictional Christianesque anti-deity wreaking vengeance on their behalf is cartooning malpractice. Not to mention, now that I think of it, weirdly anti-Christian. Unless Randy is a devil worshiper. This one… Wow. What the hell? This entry was posted in Blog and tagged art, criticism, editorial cartoons, political cartoons, Politics on May 8, 2013 by Ted Rall. So the topic of artistic style in editorial cartooning came up over the weekend, and it occurred to me that it has been a long time since I stated publicly my personal philosophy of how and why I draw in a certain artistic style. In my case, it’s a combination of what I like to see personally – the kind of cartoons I like to read – and what I think goes best with the message, obviously affected by my personal limitations as an artist. That said, as the cartoonist Tony Millionaire learned when he commissioned me to substitute for him on Maakies one week, I can draw a lot more detailed and tightly than I do. I have noticed that a lot of editorial cartoonists, and most notably the newer alternative ones whose work is, I think the best in the profession these days, tend to work in a cleaner, tighter, more cartoony style than I do. I have a theory about why that is. I think that what they have learned, and I agree with it, is that most readers tend to find that the rough edges of harsh commentary about American culture and politics goes down more easily with art that is pretty and round and fun to look at…easier on the eyes. I’m a little bit older than most of my alternative cartooning peers, with the exception of Tom Tomorrow. Both he and I came out of the punk rock and New Wave periods of the late 1970s and 1980s, and we are much more into the harsher angular look that reflects the harsh times that we grew up in and obviously the very tough society that we have before us as America becomes increasingly authoritarian. I like artwork that reflects and challenges more than art that goes down easily. I don’t feel that the American public deserves or needs to be catered to, but screamed at and shouted at. Obviously a lot of readers agree, which is why I have a fanbase, but it’s still interesting that this is not a topic that people talk about a lot. For the most part, there’s just aren’t many political cartoonists who draw in a rough, punk rock-influenced edgy style anymore. Someone like Ralph Steadman, who obviously was a brilliant artist and illustrator, is an exception. Given everything that’s going on, from Guantánamo to Iraq to Afghanistan to drones to domestic spying and torture screams for a look at the country that makes people understand that they do not live in a pretty place. That’s why I show everything scuzzy and litter-strewn and broken down, and as the Empire crumbles, I try to do artwork that reflects that. This entry was posted in Blog and tagged art, cartoons, Craft, editorial cartooning, Style on April 15, 2013 by Ted Rall. When civiliztion began, media were simple and art was lucrative. Then Arianna Huffington came along. This entry was posted in and tagged aggregation, ancient egypt, apple, Arianna Huffington, art, Artists, Civilization, gallery, Internet, iPhone, media, media barons, media owners, Rupert Murdoch, Technology on February 29, 2012 by Ted Rall.